The all-new Honda Civic Si Coupe and Civic Si Sedan debuted today in a global reveal video broadcast on Honda’s YouTube channel at honda.us/2017CivicSiReveal. 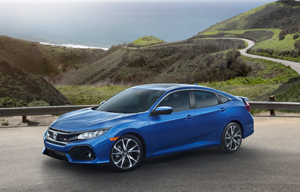 The exciting and dynamic video features the stylish, personal two-door coupe and sleek, accommodating four-door sedan – both sporty Si variants are designed for the everyday enthusiast. The new Civic Si Sedan and Coupe will go on-sale next month. Powering the Civic Si is a high-performance, high-torque 1.5-liter, directed-injected and turbocharged DOHC in-line 4-cylinder engine with dual variable cam timing (dual VTC). Mated to a short-throw, 6-speed manual transmission, the powertrain provides a thrilling new driving experience with more low-end grunt and increased torque output across the engine’s full rev range compared to the previous Si. Peak horsepower of 205 horsepower arrives 1300 rpm lower in the rev range, and the increased peak torque of 192 lb-ft (+18 lb-ft) is produced 2300 rpm earlier and sustained over 70 percent of the rev range. Allowing full utilization of the powertrain, the 2017 Civic Si is significantly lighter than the previous generation model and features a more rigid body including highly upgraded chassis and drive components. These upgrades include a dual-pinion adaptive electric power steering system with variable ratios, sport-tuned suspension, an adaptive damper system, a helical limited-slip differential, larger 12.3-inch front brake rotors and wider 235/40 R18 tires. In addition to adaptive dampers, suspension upgrades include stiffer spring rates, more rigid stabilizer bars (+30 percent front, +60 percent rear), solid front and rear compliance bushings, and ultra-rigid front upper control arms shared with the Civic Type R.
Allowing the driver to choose vehicle power and chassis dynamic characteristics according to their tastes and the driving environment, the 2017 Civic Si now features two driving mode options: Normal and Sport. From the more comfort-oriented yet well controlled default Normal Mode, the Sport Mode adjusts the suspension damping characteristics plus steering and throttle response for a more taut and direct driving experience. Upping the sporty style quotient from the standard Civic Sedan and Coupe, the Si models feature an aggressive black “wing” front fascia with larger side air intake features, 18-inch 10-spoke alloy wheels with a model-exclusive two-tone finish, wearing 235mm-wide, low-profile tires, and a chrome center-mounted polygonal exhaust finisher. At the rear, the Si Sedan includes larger side vent features and a deck lid spoiler incorporating a LED brake light. The Si Coupe continues the Civic Coupe’s distinctive full-width light bar and adds a prominent raised spoiler. The Civic Si interior features Si-exclusive bolstered front sport seats with red stitching, including stitched Si logos. The red sport stitching carries through to the doors, steering wheel and leather shift boot with aluminum shift knob. The Si interior also features a red driver’s TFT meter and audio system illumination, aluminum sport pedals and Dry Metal Carbon instrument panel trim. Accommodating modern connectivity needs, the new Civic Si also includes a 7-inch Display Audio System with Honda Satellite-Linked Navigation System that serves as the nerve centre for control of audio, HVAC and other functions. The Display Audio is integrated with Apple CarPlay™ and Android Auto™ platforms, providing seamless integration of smartphone features and functions, including app-based navigation, streaming audio, voice-controlled search capabilities, and access to a host of Apple- or Google-approved smartphone apps. All Si models feature a 452-watt, 10-speaker AM/FM sound system with SiriusXM® Radioand HD Radio™ capability. The 2017 Civic Si Coupe and Sedan are designed to provide a high level of collision safety performance in a wide variety of collision scenarios, including offset and oblique-angle frontal collisions as well as side and rear impacts. The Civic’s safety performance starts with its class-leading forward visibility and precise, stable and predictable steering, handling and braking performance. Standard four-channel anti-lock brakes (ABS) with Electronic Brake Distribution (EBD), Vehicle Stability Assist (VSA) with traction control and Agile Handling Assist further enhance dynamic stability and emergency maneuvering and braking performance. The Civic Si targets the highest US NCAP 5-star Overall Vehicle Score. The 2017 Civic Si Coupe and Sedan for the Canadian market will be produced at Honda’s plant in Alliston, Ontario, using domestic and globally sourced parts. Its engine is produced in Anna, Ohio using domestic and globally sourced parts, at the largest automobile engine plant in Honda’s global production network.